Where to Buy Maxforce FC Select Roach Bait Gel, Maxforce FC Select Roach Bait Gel - 4 x 30 Grams - $24.72 for Sale with Fast Free Shipping! Maxforce FC Select Roach Bait Gel - 4 x 30 Grams kills contains 0.01% fipronil that will kill even the most bait adverse and finicky roaches. By buying this product & leave product review you can collect normally 2 reward points as a voucher of $0.20(1%). It is no wonder Maxforce Roach Killer Gels are some of the most popular roach baits among professionals. 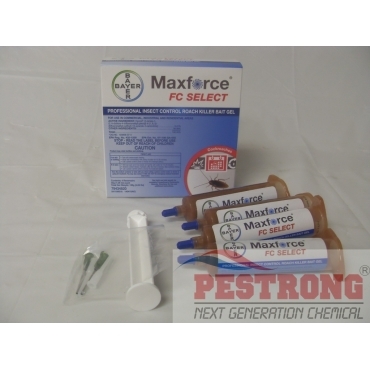 If you need more powerful roach gel bait, use Maxforce FC Magnum Gel Bait fipronil 0.05%. Trying out different types of roach gel baits to see which works best. Starting up a pest control business and Pestrong has the best prices. This product does the job right! Bait works great and the price is good. Once applied and it's all gone. This product does the job right! Once applied and it's all gone. This bait works great and the price is good.